Learn what can be done to maximize your energy throughout the day. Manage your diet, allowing yourself the foods you want and need, by controlling how much and how often you eat them. It is important to take a step back and consider your overall mission and your specific goals for increased personal energy. There's a worldwide energy crisis that has nothing to do with fossil fuels or nuclear and solar power. It's a crisis of personal energy. You’re working longer hours, sleeping less, and spending less time being active. But this is one trend you don’t have to accept. In fact, the solution is in your hands. Energy Every Day is the result of Human Performance Institute’s decades of research into the lifestyles of the world’s busiest people. Whether you’re a student or CEO, athlete or small-business owner, you’ll learn how to incorporate physical activity into your daily routine for better health and increased energy. Increase personal energy and engagement with family and friends by incorporating physical activity into your daily schedule. Adjust eating habits to sustain high energy throughout the day. Establish a personal sleep schedule that addresses your brain and body’s needs for rest and recovery. Recognize and eliminate the daily pitfalls that drain energy and create mental and physical fatigue. With Energy Every Day, you can solve your own personal energy crisis. Be more alert, focused, and attentive and reap the rewards of an active and fit lifestyle. 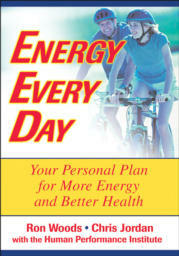 Energy Every Day is the energy plan for everybody. Ron Woods, PhD, is a performance coach for the Human Performance Institute (HPI) in Orlando, Florida, and an adjunct professor of sport science at the University of Tampa and the University of South Florida. He spent 20 years with the United States Tennis Association, including 10 years as the USTA's director of Player Development, a program that develops top junior players into touring professionals. For 17 years, Woods was professor of physical education and men's tennis coach at West Chester University. He has been inducted into West Chester University's Athletic Hall of Fame. A graduate of East Stroudsburg University and an inductee into their athletic hall of fame, Woods received his PhD from Temple University with an emphasis in sport psychology and motor learning. The International Tennis Hall of Fame awarded Ron the Educational Merit Award in 1997. He was also honored by the United States Professional Tennis Association (USPTA) as National Coach of the Year in 1982 and named a master professional in 1984. His accomplishments include eight years on the Coaching Committee of the United States Olympic Committee and the Coaches' Commission of the International Tennis Association. Woods authored Social Issues in Sport and Playing Tennis After 50 and has written and edited numerous USTA publications, including Coaching Youth Tennis, Tennis Tactics, and Coaching Tennis Successfully, all published by Human Kinetics. He lives in St. Petersburg, Florida. Chris Jordan is the vice president of facilitator training at HPI, the manager of its Corporate Athlete Train-the-Trainer course, and the director of fitness. Jordan manages the development and execution of all corporate fitness programs. He is also a regular contributor to Men's Health, Best Life, Florida Tennis, and Outside magazines. He holds a master of science degree in exercise physiology from Leeds Metropolitan University and a bachelor of science in applied biological sciences from the University of West England in Bristol. Before joining HPI, Jordan was the fitness program consultant for the U.S. Air Force in Europe at the Royal Air Force base in Lakenheath. He was also an exercise physiologist at the British Army Personnel Research Establishment of the Ministry of Defence. He is a certified strength and conditioning specialist and a certified personal trainer through the National Strength and Conditioning Association and a health fitness specialist and advanced personal trainer through the American College of Sports Medicine. Jordan lives in Orlando, Florida. Headquartered in Orlando, Florida, the Human Performance Institute is the world leader in energy management technology. The institute's corporate athlete training solutions include executive and on-site training courses, keynotes, and Train-the-Trainer courses. Corporate clients include Procter & Gamble, the EstÃ¯Â¿Å“e Lauder companies, Dell, the FBI, GlaxoSmithKline, PepsiCo, and Morgan Stanley Smith Barney. "Ron Woods and Chris Jordan have solved the personal energy crisis that people face every day. Their approach via a compelling step-by-step program not only works but is done in an inspiring way that allows you to achieve your personal goals." "Lose weight without dieting, gain more energy without artificial means, and just simply feel great, both physically and mentally. Read it, follow it, and change your life!"